Every year, October 4-10 is designated World Space Week by the United Nations. It’s a natural opportunity for space enthusiasts, particularly NSS Space Ambassadors, to engage in activities that attract public interest. 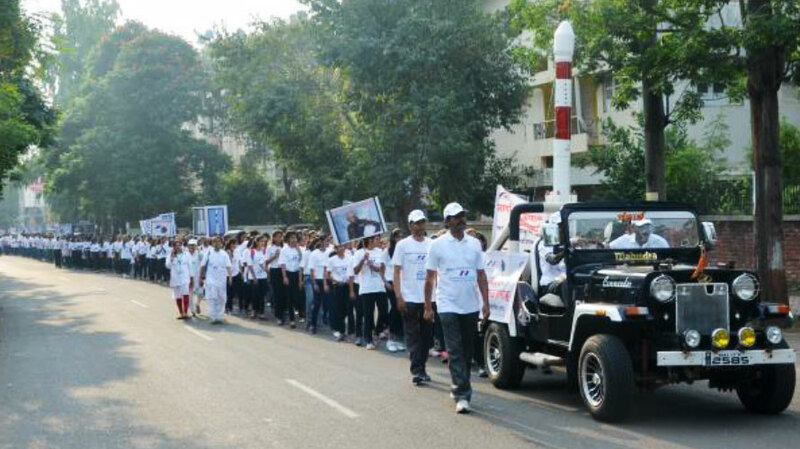 This year, Certified Space Ambassador Avinash Shirode did an exemplary job of that in his Nashik, India, community. The Nashik Chapter of NSS, in cooperation with the Maratha Vidya Prasarak Samaj educational institution, sponsored a full week of activities. The opening event was a rally of nearly 1,100 students and a delegation of civil and educational dignitaries. All wearing shirts and hats with the NSS Logo and World Space Week legend, they formed a long column as they walked along the streets. The afternoon featured the opening of a display of student projects and a presentation to middle and high school students about career opportunities in space communication. A dozen speeches were presented during the week by experts including a former chairman of the Indian Space Research Organization (ISRO) and the dean of the ISRO Indian Institute of Space Science and Technology. There were many opportunities for student interactions with technical experts. Remote presentations were also given by several people including representatives of NSS, the Mars Foundation, and the Oklahoma Space Alliance. “Space Unites the World” was the theme of the 2018 World Space Week, and that theme was highlighted by an online assembly of NSS chapter members from the USA, Germany, Nigeria, and India that was watched by other chapters around the world. In fact, all the week’s events were streamed live via YouTube, making it potentially a world-wide experience. Finally, the week culminated with award presentations for student essays, posters, and models related to space topics. This week-long celebration of space can be an inspiration to all space enthusiasts to observe World Space Week in some way. It’s not necessary to organize on such a large scale, either. The theme for 2019 will be “The Moon: Gateway to the Stars.” Think of ways you can speak about that, create art work about it, read a related book to an elementary school class, or conduct a poetry workshop at a local library. There are many ways to educate and inspire your community about space exploration and settlement. Start preparing now. If you have not already applied to become an NSS Space Ambassador, consider doing that. Information about the Space Ambassadors Program is available at space.nss.org/space-ambassadors. Resources are available to help Space Ambassadors prepare and deliver presentations. All that is required to maintain their status (or progress from Candidate to Certified status) is two presentations per year. World Space Week, October 4-10, 2019, will be a perfect opportunity to give a presentation or two. The Space Ambassadors Committee members are happy to help applicants with their presentation development and even provide presentations that applicants can use, with or without modification.